Do you love to tumble rocks until they are smooth and shiny? You will love this mix of natural minerals from Mini Me Geology. This mix has samples from 0.5-inches to 2.0-inches in size so that some samples will polish quickly while larger samples will require a little more patience. 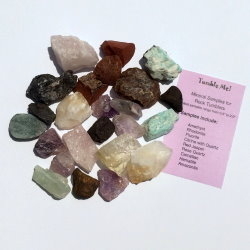 Each mix comes with approximately 24 colorful samples that may include: carnelian, amazonite, hematite, fluorite, rose quartz, citrine, quartz, amethyst or red jasper. Each Tumble Me box comes with a list of the included samples.